Keep a good distance from the bike in front of you, so if the bike stops without warning, you can come to a safe stop. When you are riding on the main road with a group of friends, you must be very careful and it is best to not have more than six of you riding together two abreast, so that drivers have a good chance to overtake if they wish. Telling other riders what you are going to do really helps to. If you do something no one expects and you haven’t told them or given a clear signal, you are much more likely to have an accident. Jersey has many cycle routes and these are being continuously improved and developed. Some of these take you off road, but even then, you still have to careful when using these routes, as many people get hurt when using them. You still need to wear a cycle helmet and ride with care and be considerate of others who may be walking or cycling. There are also some suggested leisure routes that have been developed by Jersey Tourism, many lead through our ‘green lane’ system where vehicles are not meant to drive at more than 15mph. Unfortunately, many vehicles do drive at speeds greater than this, so you still have to be very careful when using these lanes. We do now have some cycle lanes painted on the road. They have white edging and a white picture of a cycle, green paint may be used to help them to be seen by road users. These should not be confused with the cycling signs used to help guide tourists in St Helier. Although this has been marked especially for cyclists, you still have to be fully aware of what is going on, and follow the ‘rule of the road’. Most of our cycle paths & tracks are shared with pedestrians, many of whom may have a dog with them that might not be on a lead or children who may be running free as well as some in buggies. On our railway walk, there may additionally be pot holes and pine cones to keep out of the way of. Ride very carefully in these areas, never ride too fast where it would be difficult for you to stop quickly. You are not allowed to ride your bike on a pavement unless there is a sign allowing you to. Some of our routes take you along pavements, be careful to do this slowly as you will come across pedestrians also using the pavement who will need you to avoid them. Sometimes you will have to cross the road from one pavement to another. If you are coming up behind pedestrians on any of these facilities, sound a warning with your bell. We don’t have bus lanes in Jersey, but of course you may end up riding somewhere else in the United Kingdom or the Continent where you can. 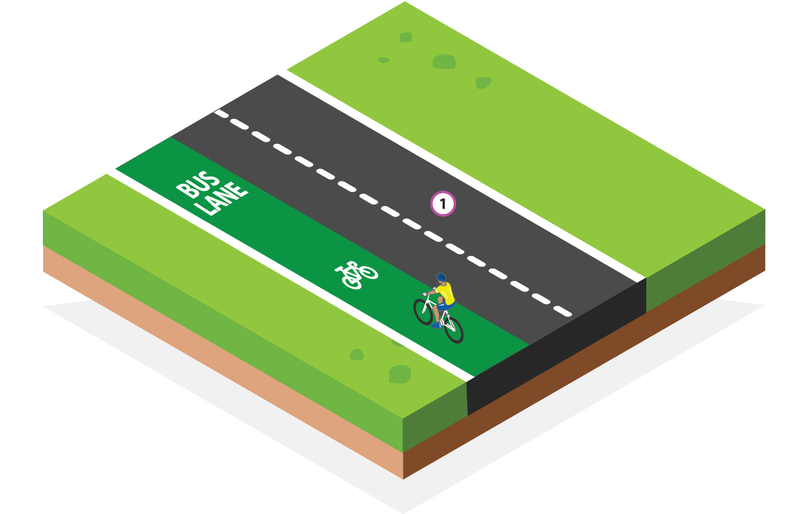 You may use a bus lane provided that there is a picture of a bike with the bus. If there isn’t a picture saying you are allowed to, then you aren’t allowed to. In busy cities or towns, this can improve your safety and help you progress through traffic. Remember though, if you have to overtake a stationary bus picking up or dropping off pass them very carefully as you may have to stray into the next lane that could be very dangerous. This can be very dangerous. It is very tempting to ride very fast downhill, but lots of accidents and serious injuries happen when people do this. Make sure you NEVER ride at a speed where you can’t easily stop under control if something happens that you don’t expect to happen. Make sure you ride in the correct gear with your fingers covering the brakes at all times, using your back brake to help control your speed. As you approach a bend on the road that you cannot see around, always make sure you have moved to the primary riding position and always reduce your speed, so if there is a queue of traffic that has stopped around that bend, or a car has broken down for instance, you are able to easily stop safely without hitting anything. If you see someone with a cane or guide dog trying to cross the road you may need to ring your bell to warn them of your approach. Be very careful if you need to overtake or go around a partially sighted person with a guide dog, remember you may startle or confuse the dog. You may need to wait for the person to clear the area before continuing your journey.